I read these words by Madeleine L’Engle on a plane coming home from a trip to Canada to see dear friends. Before we left for the airport Mark and I watched a news ticker run across the bottom of a television screen in the lobby of our hotel. Rumors of war. Break-ins and break-ups. People shouting at each other. “Things are hard all over,” I thought. L’Engle thought the same when she wrote A Circle of Quiet, which contains this quote, all the way back in 1972. I had to check the date because it seemed to me it could have been published yesterday. She talked of what we do now—uncertainty and division, pain and injustice. She also talked of hope and love, joy and creativity, faith and finding our way back to each other. Sometimes when I try to sort out what’s going on in the world it feels like looking out the window of the plane where I sat with L’Engle’s words. Everything seems so far away, so untouchable, and I feel trapped and helpless. In those moments I’m tempted to believe the worst about the future, about humanity, about my own self. But then I remember Jesus and I start to get my feet on the ground again. He lived on this spinning, mixed-up, mud-covered earth too. He showed us making a difference is possible. All it takes, as Madeleine L’Engle said, is lighting a candle in the darkness. We light a candle when do the small things, when we smile instead of scowl at the unreasonable individual who has too many items in her grocery cart in the express check-out lane at the grocery store. We light a candle when we pick encouragement over gossip, even though the latter is more tempting than a chocolate chip cookie still hot from the oven. We light a candle when we rock our babies to sleep, when we whisper a prayer, when we care for the details on the spreadsheet at work like we’re tending a rose garden. Our hope is not that the world will get better. It is not even that we ourselves will get better. This world and humanity will inevitably disappoint. Our hope is that we serve a God who’s still working, whose purposes can’t be defeated by the greatest evil, who slept in a manger and walked in our shoes for a while, whose love is the flame to our candles. “The Word gave life to everything that was created, and His life brought light to everyone. The light shines in the darkness, and the darkness can never extinguish it” (John 1:4-5). p.s. 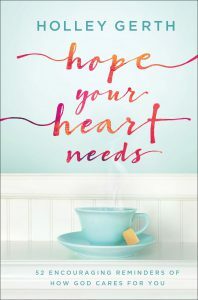 I have a new devotional releasing September 18th called Hope Your Heart Needs: 52 Encouraging Reminders of How God Cares for You. I’m so excited about it! Each day talks about a different characteristic of who God is and how He loves us. Writing this book changed my life and I truly believe reading it will change yours. It’s available for preorder. And here’s a free excerpt. Thank you, Holley, for lighting a candle of hope today! And for the reminder that we are light because our hope is in Jesus! Madeleine L’Engle’s sensitive spirit was like a candle flame that flickered in the chaos-gusts of the 70’s–so much like the present-day news feed. May we also burn brightly, and may our flickering lights be an encouragement to others who are holding their candles high. When the world’s need seem so overwhelming and my efforts so feeble, it’s encouraging to know that I only have to let His light shine through me where I am. I may not be able to do anything about the whole world, but I can hold the light up to my own sphere of influence in it. 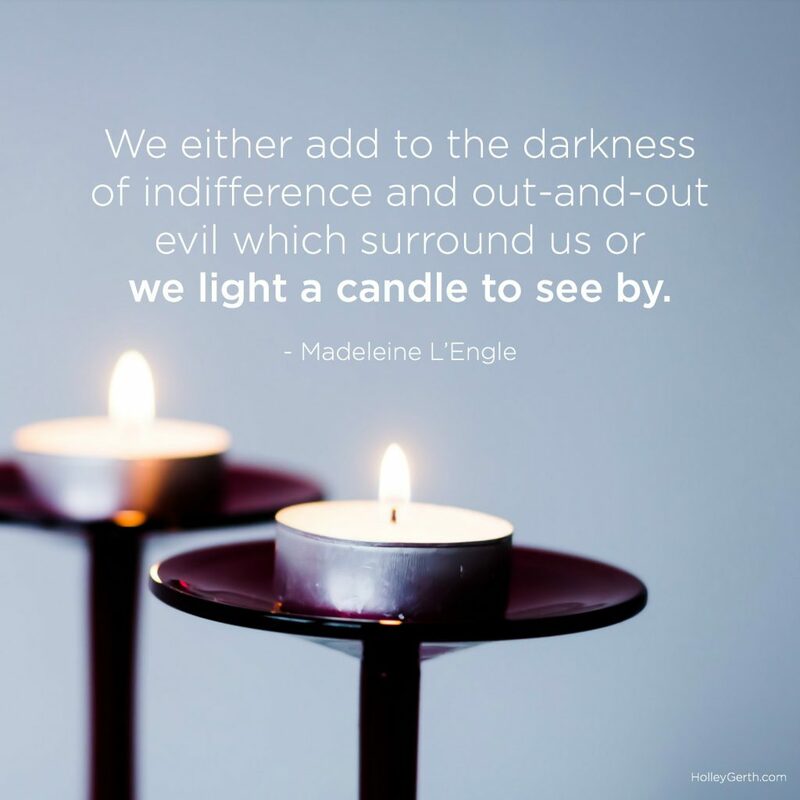 So easy to focus on what’s wrong and all the chaos of the world, that we forget the positive and the power our candle can have, especially when we join with others. It’s a struggle remembering I am not in control, nor is anyone else, but that God is and he can handle this. love that quote – reminds me of a Bob Goff thought – we are here to show and be God’s love to everyone we meet every day. no exceptions. Your book looks beautiful and it’s sorely needed – all our fears and cares are met in the character of God. That’s it. Oh, how I needed this today! At my workplace, everything seems so negative and there are so many rumors and gossip seems to run amok. The last paragraph above brought tears to my eyes and reminded me that there is far more beyond today and the disappointments and harshness that always seems to be there. Thank you Holley for your encouraging word! Thank you. When it seems like darkness is everywhere, it is powerful to remember that His light shines in the darkness and it can NOT be overcome…not in any situation. Thanks for lighting a candle in the ever present darkness. Keep up the good and holy work. This post reminds me of a Kathy Troccoli song “Go Light Your World.” Here is the chorus: Carry your candle, run to the darkness Seek out the hopeless, confused and torn Hold out your candle for all to see it Take your candle, and go light your world Take your candle, and go light your world. God is asking us to shine our light of His love on this world. It may look like making food for a neighbor who lost her last son & sit with her in grief. You can pray for others, take someone to church, call & see how friends are doing.. John Wesley had an apt quote: “Do all the good you can, By all the means you can, In all the ways you can, In all the places you can, At all the times you can, To all the people you can, As long as ever you can.” That is all Jesus is asking us to do for our sinful world. By doing stuff for others you are making an impact on your world. You are going out & making disciples by showing God’s love! Thanks for this gentle encouragement, Holley. I love that we can make a difference through even our smallest actions. “All it takes, as Madeleine L’Engle said, is lighting a candle in the darkness.” Amen. I agree! Each of us can light a candle in the world and make a difference. Thank you for sharing. I thank God for you Holley, you have no idea how many times your posts have gotten me through the day. I have been receiving your posts I think as long as you have been writing them. God has certainly used you all these years. 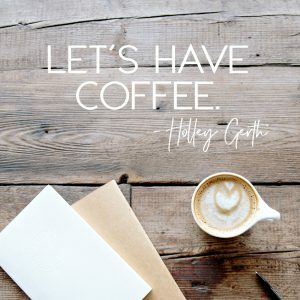 Beautiful encouragement, Holley! Love that Madeleine L’Engle quote. Praise God that his purposes can never be defeated, that he fuels the flames our candles with his love. We tend to forget the far-reaching effect of a candle flicker. They say on a very dark night it can be detected from thirty miles away! How much more can our powerful God use the tiniest flicker from our candles. I’m grateful we can gather here and shine together wherever Jesus places us this week! How can we get a couple cases of your HOPE DEVOS FOR CLIENTS AT Refuge Pregnancy. They’d be perfect for these struggling moms.